Click here for the latest events and information to Stand Against the Cuts. It’s easy to stay connected to Saskatchewan’s community union. 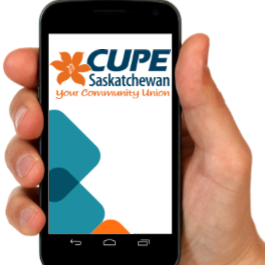 Sign up for CUPE Saskatchewan email updates to get the latest in union events and news delivered to you – even on your phone! 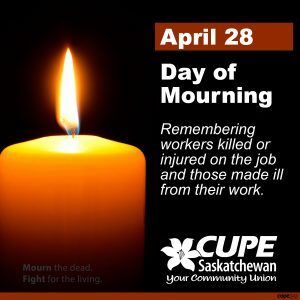 April 28 is a National Day of Mourning to remember those who tragically lost their lives while at work and to recognize those who endured an injury or acquired an illness or disease as a result of their work. Sadly, 48 Saskatchewan people died as a result of their job last year (2018) from occupational disease and traumatic events, not including farm-related fatalities or other workplaces that are not covered or reported by workers’ compensation. The total number of workplace fatalities and total overall injury rate increased from 2017. Over 22,343 workplace injuries occurred in Saskatchewan workplaces last year and were accepted by Saskatchewan’s Workers’ Compensation Board (including time loss claims and no time loss claims), among the over 28,952 claims reported to WCB. 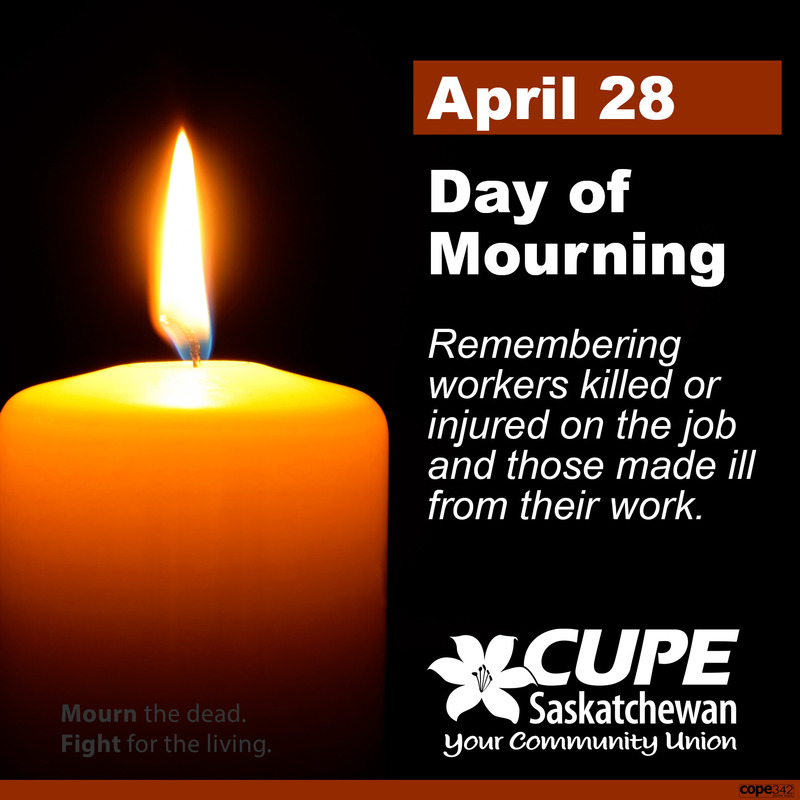 On the National Day of Mourning for Persons Killed or Injured in the Workplace, we remember those we have lost and we renew our resolve as workers and union members to defend and improve workplace safety standards. Attend a ceremony of observance in your community on Sunday, April 28, 2019. Click “Continue Reading” for event listings. 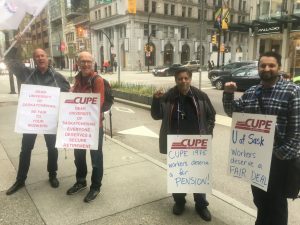 VANCOUVER: Peter Stoicheff, president of the University of Saskatchewan, was greeted with surprise information pickets in support of CUPE Local 1975 at recent alumni events in Victoria and Vancouver. The two events were organized by CUPE members and activists. Activists handed out information about the labour dispute and talked to attendees about the issues facing the local. 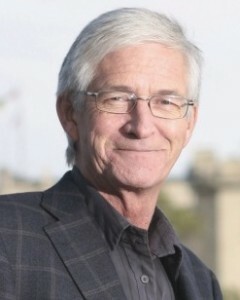 The University of Saskatchewan is pushing a three year wage freeze and wants to dismantle the local’s secure defined benefit pension plan and replace it with either a defined contribution or target benefit plan. CUPE Local 1975 has a strong strike mandate from its members and will be in a legal strike position upon the conclusion of a labour board hearing on essential services. Registration is now open for the Back to Batoche Canoe Trip: July 16 – 18, 2019! 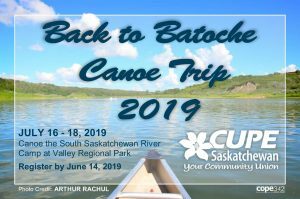 Registration is now open for the Back to Batoche Canoe Trip 2019. During this annual voyage, participants navigate the waters of the South Saskatchewan River by canoe beginning at Clarkboro Ferry Crossing (formerly Warman Ferry Crossing) and arriving at the historic Métis community of Batoche—learning Aboriginal culture, history and traditions along the way. The CUPE Saskatchewan canoe trip coincides with the Back to Batoche celebrations of the Métis Nation in Saskatchewan which take place on July 18 – 21, 2019. After the canoe trip, participants are encouraged to attend the Back to Batoche festivities. Spaces are limited! Register today! Please provide your email address with registration. On April 1st, Saskatchewan now has the dubious distinction of having the lowest minimum wage in the country. In Saskatchewan, 20% of the entire workforce earns less than $15 per hour. Provincially, about 40% of all workers earning minimum wage are between the ages of 15 and 19. However, workers between the ages of 35 and 64 constitute the second-largest cohort of minimum wage earners at 30% of the total. 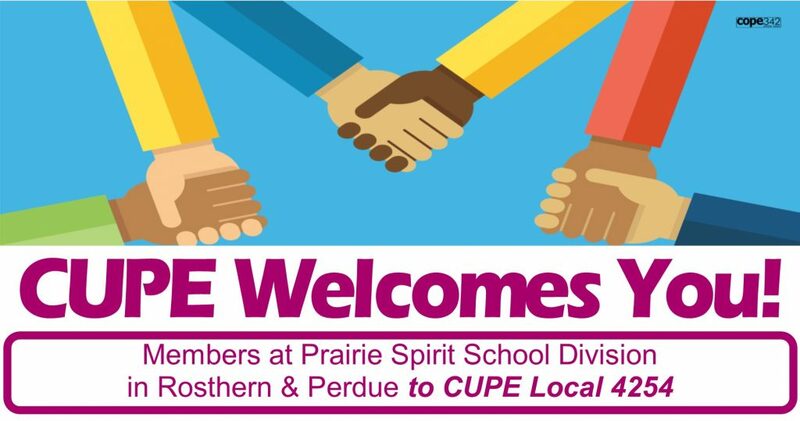 CUPE Local 4254 is welcoming new members into its ranks after a successful organizing drive in the Prairie Spirit School Division. CUPE’s organizing drive, which started in November, has added educational associates from Rosthern Elementary School and Rosthern High School and the Perdue caretaker to the CUPE Local 4254 bargaining unit. CUPE Local 8443 has ratified a new collective agreement with Saskatoon Public Schools. Over 450 members cast ballots, and the result was a 67% vote in favour of the proposal. Access to clean and safe drinking water and wastewater services are essential to human life and health, and clean water supplies sustain our environment and planet. 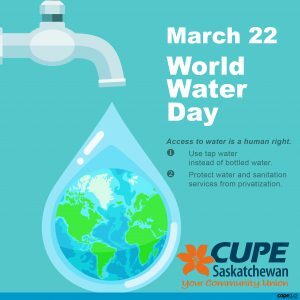 On World Water Day on March 22, CUPE renews its commitment as public sector workers on the frontline to protect and defend water and wastewater (sewage) services from privatization that takes away public ownership and control of water, including from commercial exploitation through trade agreements or bottled water. Sustainable management of our water systems and water supply can only be possible through public ownership and control to ensure that human need and responsible environment stewardship are always a priority. Yesterday’s provincial budget is balanced in favour of bureaucracy, at the expense of front line care, says CUPE Local 5430. The merger of 12 health regions into the Saskatchewan Health Authority was predicted to save $20 million annually, with all savings being directed to front line care. But there is little evidence to show that such cost savings were realized. CUPE members are facing unprecedented workloads due to understaffing, underfunding and higher patient acuity and resident care needs. This results in more exhaustion, workplace violence and injuries. 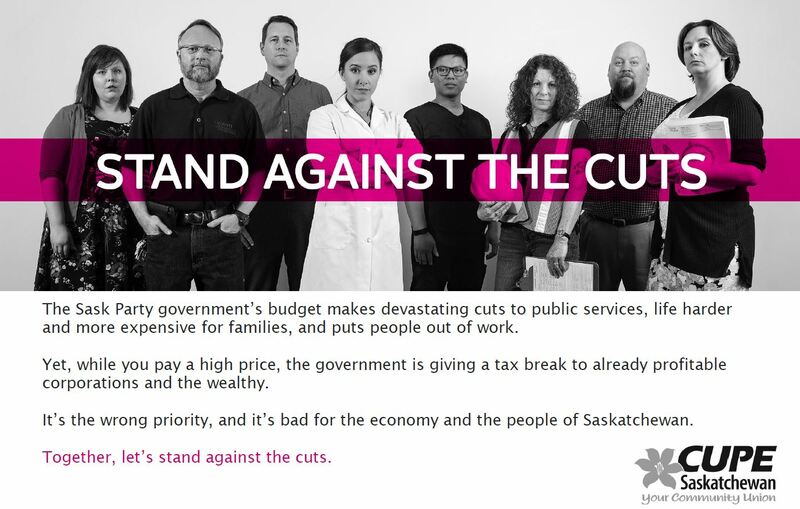 Today’s budget delivered disappointment and disrespect for working people and public services of Saskatchewan, says CUPE Saskatchewan. 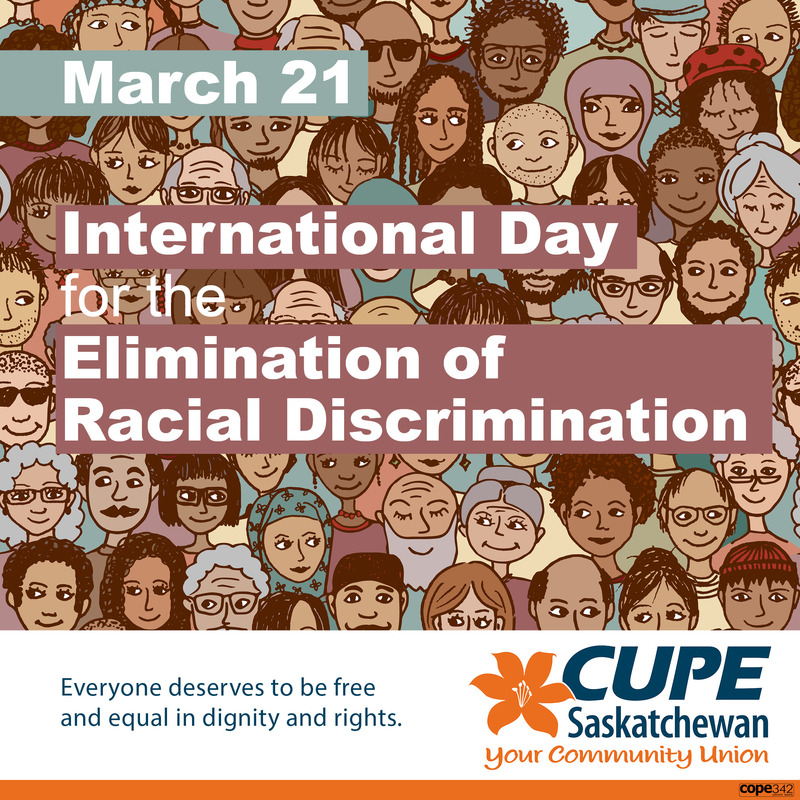 March 21 is the International Day for the Elimination of Racial Discrimination. 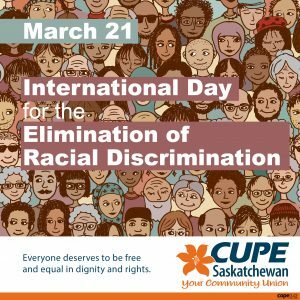 It’s a day to renew our commitment to confront and end discriminatory treatment and intolerance wherever it exists, and it’s a day to recognize the human suffering caused by the injustice and stigma of racism. It’s a day to renew our efforts to make our workplaces and all levels of our union reflective of diversity, and it’s a day to renew our efforts to advocate for fair and equal rights for all members, regardless of race or ethnicity.